Score: Finally something involving zombies that isn’t stiff and lifeless. 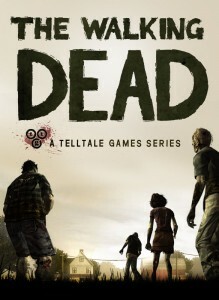 I’ve mentioned The Walking Dead by Telltale Games on a few occasions. The time has come for an official review. The Walking Dead’s is an adventure game in a classical sense. The PC port even features point-and-click controls. Problems occur or obstruct your progress. You solve them by exploring areas, collecting debris, and clicking on every interaction point until whatever object you picked up progresses the story. Sometimes the puzzles are conversations. The game isn’t difficult but you will die a couple times. The low learning curve and fact that this game is available on every platform possible allow for any fan of the series to play. I’m not a fan of the series so I see it as a good opportunity to indoctrinate non-gamers. If you have a friend hesitant to “learn video games” this is a great introduction to the scene. They don’t like zombies? Don’t worry it’s good in spite of them. The basic but endearing gameplay never leaves the player confused. Puzzles are solved in logical ways. 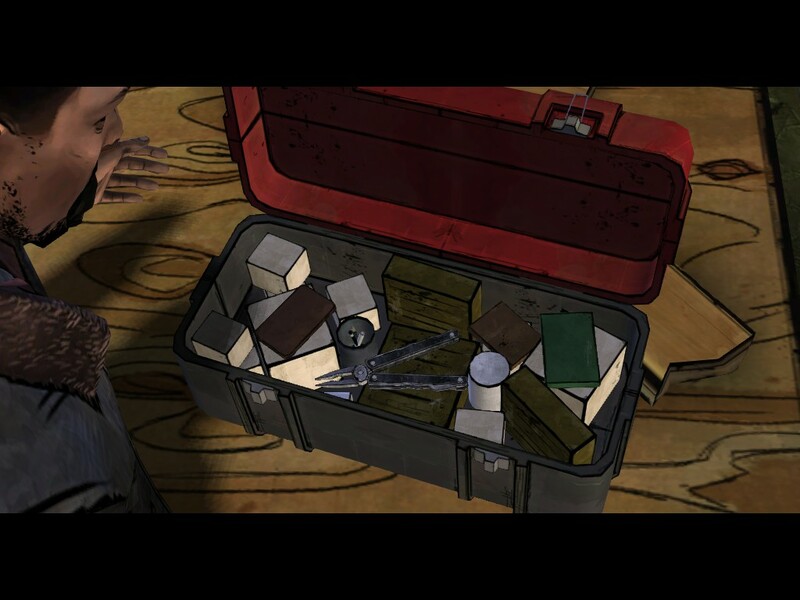 I audibly cheered when, in an adventure game, a multi-tool I picked up solved multiple puzzles. The real success of The Walking Dead’s gameplay is the action sequences. I’m reminded of Heavy Rain when reflecting on the more adrenaline fueled moments. The game utilizes a handful of “zombie gauntlets” and environmental hazards that are solved by furiously smashing buttons and clicking as fast as you can to find the interaction point. Certain dialogues will have a timer for your response. The Heavy Rain scene. If you haven’t played it yet go do that. The action sequences were as fulfilling as the car segment from Heavy Rain and as suspenseful as the scene I’ve dubbed “Night Intruder.” Having dialogue force you to think fast makes consequences real and often leaves you with that all-too-familiar sensation that you said the wrong thing in the heat of the moment. Ever argued with your significant other? Yeah, that feeling. Dialogue is well written and robust. Most importantly, unlike other zombie things, the acting isn’t saturated with melodrama or camp. Conversation trees are interesting and realistic by any measure. As an added bonus your decisions affect the gameplay itself. This is the exact thing I want from video games – art and gameplay enhancing each other. The game is visually appealing too. It adheres to the style over graphics approach and executes it well with awesome Cel-Shading (a style I’ve long supported). “Functional, interesting gameplay, stylistic art direction, and solid dialogue are all good things. Plenty of games can boast that. Why should I play this one Andrew?” I agree dear reader there are a lot of great games and you should play them all. Read on for the reason to play The Walking Dead the video game. Lee’s status as a convict is a cause of natural tension in the group. 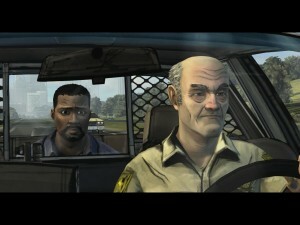 In The Walking Dead we assume the role of convicted felon, Lee Everett. Episode One begins with Lee meeting a little girl named Clementine. Clementine is the driving force of the game. Plots and subplots arch around her. Decisions are made or changed because of your relationship with Clementine. I like to think of this video game as the backstory for the little girl that grows up and saves the world as narrated by Lee Everett. The Walking Dead struck a personal level because of her. Characters I would normally let die without a second thought became redeemable with a word from this child. If her life was threatened, I was an unstoppable force and uncompromising judge. The more the relationship between Lee and Clem grows, the more vested I personally felt in keeping her safe. Gameplay that hinges on decisions and relationships is rarely executed well. Often times it’s a gimmick to get gamers to purchase the next generic WRPG. “Your decisions matter, character relationships change.” No, “other games,” you mean there’s a Friendship meter that fills up and two cutscenes that change based on very specific, often obvious moments in gameplay (i.e. eat the baby or don’t eat the baby; push the green, red, or blue Deus Ex Machina Button). The Walking Dead achieves a sincerity that so few games using the “interactions matter” shtick ever do. It does it with a largely linear story. It’s always going to end in the same place but how you get there, and what you feel along the way matters the most. Multiple endings and the evolving dialogue chains lose their luster when compared to the ultimate achievement of the Walking Dead: You, the gamer, feel more for Clem as the game progresses. You pilot Lee to do more for her. The only ending that matters is that Clementine is safe. I didn’t tear up playing this game – as some of my peers confessed – I did find myself pausing to contemplate my mortality as it relates to raising my own son. Any game that can do that, or leave me in a ponderous daze after I’ve completed it has done something great. Oh yeah, there’s zombies too if you’re into that sort of thing.